Eric, sorry if I was crabby, mate. I was having a really crappy day yesterday. No hard feelings. The rank insignia is something I will definitely consider for a later date. Also, Adrift audio? Link me! @Wayne - Mate, absolutely no problems and all is totally forgiven. The audio files are in the resources page somewhere - it links to my google docs. I have a large video file of star field with the bridge sounds added but it is too large to download (it fails - a lot) something about living in the middle of no where and having internet you have to pull start to use I guess. Motion Picture, Wrath of Khan and First Contact uniforms and props. Phasers, Tricorders, communicators and PADDs vary from movie to movie. For now I've chosen my favourites and will most likely add the others at a later date. I've also added TOS Andorian antennae for the TOS and TOS Pilot periods. I've tidied up the hand and arm positioning in places where it was a bit patchy. Wrist connections are still scrappy on bare arms. I'll look at that for the next build. I've also included a new loading screen. As ever the app can take several minutes to load depending on your connection. Please be patient. The new loading screen is stunning... It is honestly a pleasure to watch load. Regarding Andorians: Can you please have two different species of them so we can have old school antennae outside of the two TOS categories (and vice versa)? @David - Probably. I'll look in to it for the next build. Minor Update: Okay, apparently Andorian antennae weren't showing up in the TNG movie era. I fixed it but at the same time, as it was an easy mod, I have per David's request, added the option to have either classic Andorian or modern Enterprise style Andorians in every era. Enjoy. 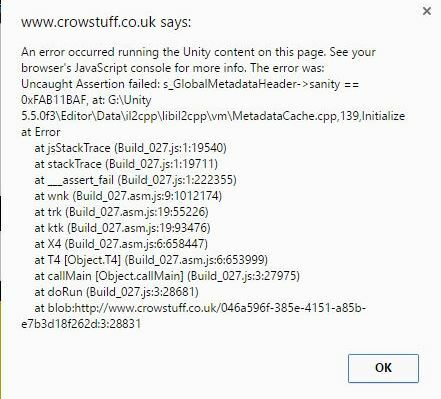 So, sorry to disrupt the joyous mood of a new update, but I've gotten an error in Chrome in the latest version. 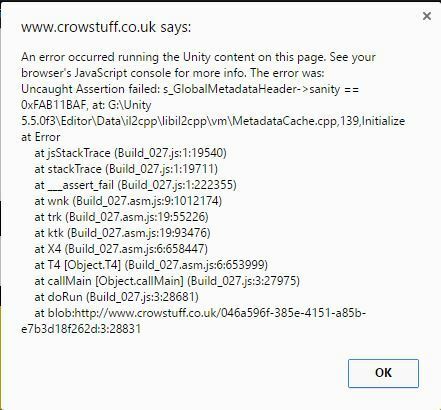 Attached is the error message. In the meantime, I'm using another browser. Again, fantastic update! Yeah, Chrome continues to be sketchy for some people. Unfortunately it's beyond my technical knowhow to figure out why at the moment. Out ot interest. Are you using Chrome in Windows or iOS and is it 32 or 64 bit? Okay, gentlebeings. 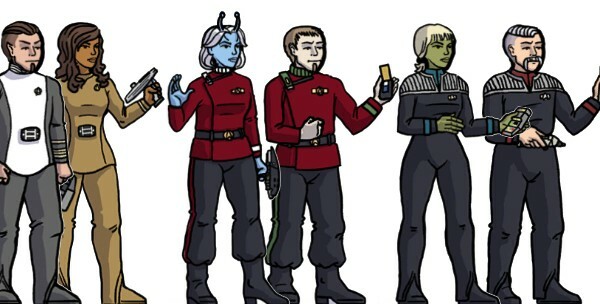 John over at the Star Trek Tabletop Gaming Facebook group has asked me to put together a banner for the group featuring a row of characters from the minimaker. If you'd like your character to be included post a screengrab here. I'd like to have one from each era and a good mix of male and female and different species and there's limited space, so I can't promise to use them all, I'm afraid but let's see them anyway. Aha, the point is now moot. I was running Windows Chrome 64-bit, but there was a Java update this morning that fixed the problem! Surprise surprise.